SEMrush offers many ways to edit the details of your account on your own with the My Profile menu. You can access this section from the icon at the very top right of the SEMrush interface. From there you can manage your profile settings, check how much of your account limits you’re using, and make changes to your account. If you need personal assistance with something regarding your account, you can always reach out to us at mail@semrush.com and a team member will be happy to help you. Under the Profile Settings you will be able to see your registration date, the email associated with your account, your profile ID. This info cannot be changed manually. If you want to change the email address associated with your account, please email us at mail@semrush.comand we will process the change for you. The Subscription Info tab is where you will be able to see the real-time status of your account limits, API units, billing information, and payment history. From here you can upgrade your account to access a higher number of Project limits and features. The number of units you have on your account is directly related to the type of subscription you have with SEMrush. For a comparison, please refer to our pricing page. If you want to change the credit card linked to your account, all you need to do is click on the blue change button next to your credit card description in the Billing Info page. The Payments tab will allow you to easily see all of your previous payments and invoices. Finding a copy of your invoice is easy, you simply click on the invoice button to the far right of your payment. If you have more than one user or session associated with your subscription, you can manage them from the Manage Accounts page. If you don’t have any yet, you can add another user to your account from the Subscription Info page with the "Buy more" button. A standard SEMrush subscription allows for one email address to be logged in at a single time. Users and sessions are two options for allowing more people to access your account. If you add sessions to your account, you can have more than one person logged in and using SEMrush under your email address at once. When you add sessions to your plan, all limits and Projects are unchanged and shared between whoever logs in with the email and password. If you add users to your account, you can share your SEMrush plan with another email address that acts as a log in and shares a defined amount of your plan’s limits. With a user, you can dictate how many limits you give to the other email addresses under your parent email. Read more about adding users and sessions to your plan here. 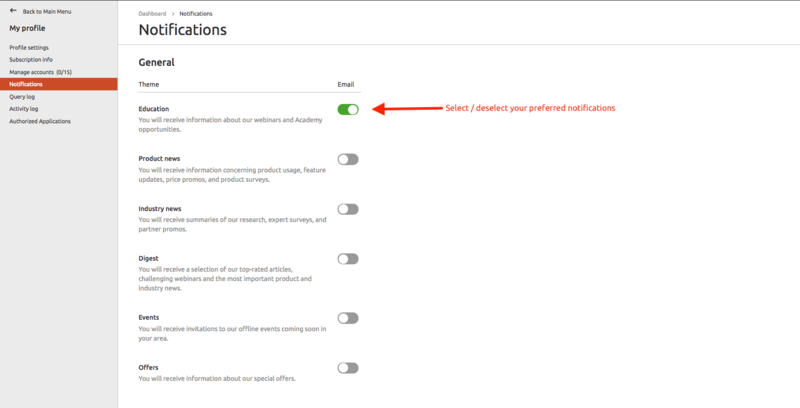 If your account is registered in a country affected by the GDPR, you have the ability to manage your emails notifications from the “My Profile” panel. Just go to your Profile and select Notifications. More details of our Data Processing Agreement required by the GDPR can be found here.